Very few kids get the chance to have an experience that teaches them more than they could ever learn in school, and gain skills that will serve them for a lifetime. My name is Seth Bobrow. I am 14 years old, and I am lucky enough to be one of those kids. My family and I built a log cabin from ground up. 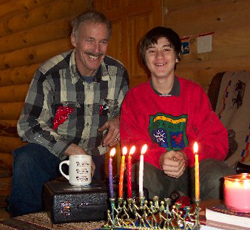 Last year, we celebrated Hanukkah in a half-built cabin hovering over Hanukkah candles for warmth. My mother thinks of this as an unconventional way my stepfather and I are learning about Judaism. I am still deciding on what faith fits me best, so I did not feel very strongly about having a traditional bar mitzvah, but I believe that helping to build my family’s log cabin was like an unconventional bar mitzvah. I turned 13 during the construction process. Now I am 14, and I feel like the experience was like a coming of age. It has made me more mature then any other ceremony could make me. Bar mitzvahs are about becoming a man spiritually and emotionally, and with this experience, I feel more manly then ever. A few years went by and our rugged lifestyle became less rugged as we installed a water well and electricity. In 2007 we cleared some of the land and in 2008 my family broke ground and started building. Watching the birth of a log cabin was definitely exciting. A huge hole in the ground became a basement, sheets of wood became floors and piles of logs became walls and staircases. I make it sound easy, but keep in mind this is not a job for the faint of heart. While the “shell” of the house was being built, my step-dad had to walk across 30 foot log beams without a roof or ANYTHING to break his fall if he made a mistake. One wrong step and he would plummet to his death and become a parent pancake. Seth Bobrow driving a tractor. Everyone in the family had a certain job. Tim was the builder. You name it, he could make it, from simple shelves to installing the plumbing and electricity. He could build almost anything with a hammer and nail, but he also had loads and loads and loads of construction equipment. My step father rehabs old homes, but he never built a log cabin before. My mom was the designer, chief cook and bottle washer. She also learned new construction skills as did I, the untrained assistant. There is a variety of things to do when building a cabin and all of it was new to me. I “assisted” in carrying logs, showers, benches, stones for the fireplace, twenty-five hundred pounds of bamboo flooring, and garbage bag after garbage bag, after garbage bag of building debris and recycled material. I started out scrawny, but soon I felt like Arnold Swartzenager–well, a miniature Arnold Swartzenager. I learned, building the cabin, that when you build something, you get out of it what you put into it. I don’t just mean the harder you work, the better it turns out. What I mean is that the more things I helped with, the more I learned about construction and life skills. I now know how to drive a bulldozer, operate a power sander, build and stain a deck, chop logs, install light switch plates, clean a room covered with mountains of saw dust and build a dock and a fireplace. I plan to take advantage of these new skills, or at least brag about them to all of my friends. Is a log cabin builder also a chick magnet? One can only hope. Building the cabin required a lot of hard work and long hours, especially for my step-dad, whom I learned a lot from. I learned more than new construction skills. Let’s just say that I learned some new words when he made a mistake or hurt himself. Building the log cabin together with my family also allowed us to spend more time together. It was relatively quiet time. There were no TV or computer distractions, which was a difficult adjustment for me, but we did have fun. My step-dad, my mom and I would canoe, swim, watch stars and play in the snow in our free time. In the evening, we would play cards. Uno never gets boring. I also had some time to myself. I would usually explore the woods when I wasn’t needed. There is a place less then a mile away from my cabin that looks like an alien land, or like someone cut a chunk of the Grand Canyon and dropped it in the middle of our flat Wisconsin woods. There’s a rushing root beer-colored river surrounded by unusual rock formations. It is a very peaceful place. On another adventure, my mom and I decided to hike THROUGH a river, which seems like a harmless idea at first… or so we thought. The hike was supposed to be short, but after an hour of trudging through the river, the sand turned into pointed rocks, and the ankle high water became waist high. Three wet and tiring hours later, we finally found some signs of civilization; an exit strategy from the deceptive river. We were “rewarded” with an extra 30-minute mosquito and poison ivy infested hike home. Building the cabin is a more comfortable activity. The cabin itself is almost completed. There are still a few tweaks here and there but overall it feels like a beautiful piece of art. It is a great privilege to contribute to turning a space of weeds, trees and soil into a log home. It does feel like home to me, now–a place of many emotional ties, memories and lessons. I’m sure there will be great memories ahead. I never thought that a building project could bring me closer to my family. Every mistake that was made, every problem solved, every story shared, and every piece of advice that was given made me feel more connected with my family. The truth is that sometimes I was helpful, and sometimes I could tell that I was a handful. I am a teenager after all. Don’t blame me; it’s my hormones. Sometimes my parents were great and sometimes they were annoying. They’re parents after all. Don’t blame them; it’s their hormones. The important thing is we all got to know each other better and grow together. I built a log cabin with my family, but we also built a closer family in the process. Seth Bobrow lives in Shorewood, Wis., and is an 8th-grader at Shorewood Intermediary School. His mother is Jewish; his stepfather was raised in a Mormon, Catholic and Lutheran home and is now unaffiliated with any particular religious group.